The Soberanes Fire burning in Monterey County, Calif. is seen on Saturday, July 30, 2016. BIG SUR, Calif. -- Officials conformed on Tuesday that the massive Soberanes Fire, which began July 22 in Garrapata State Park north of Big Sur in Monterey County, was started by an illegal abandoned campfire. The fire has ravaged over 43,000 acres and forcing 350 people to evacuate. One person is dead and 57 homes destroyed in a wildfire in Monterey County that burned another 4,000 through Sunday, fire officials said. A man who was driving a bulldozer as a private contractor to help extinguish the fire died when his dozer overturned sometime Tuesday night or early Wednesday morning, Cal Fire officials said. Robert Oliver Reagan III, 35, of Friant in Fresno County is the only death so far. Last Tuesday, acting Gov. Tom Torlakson, the state's superintendent of public instruction, declared a state of emergency in Monterey County. Gov. Jerry Brown was away at the Democratic National Convention in Philadelphia. Firefighters have the fire 15 percent contained, according to Cal Fire officials. Because of the destruction, the Federal Emergency Management Agency is making federal grants available to the state for up to 75 percent of eligible firefighting costs, FEMA officials said. 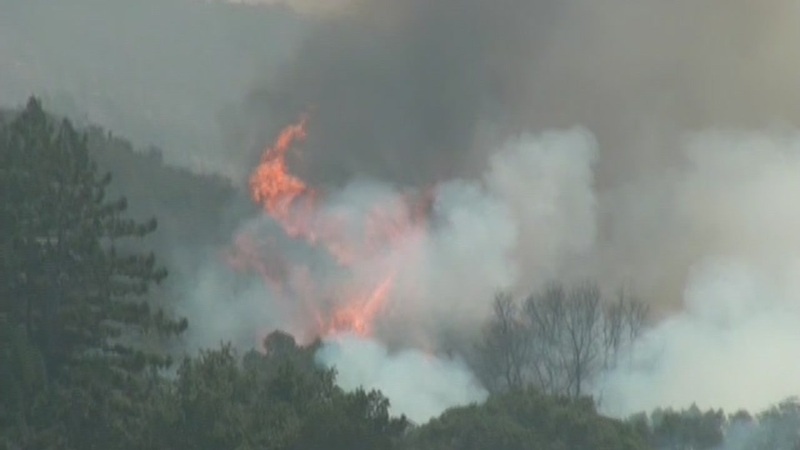 More than 5300 fire personnel are working to extinguish the blaze that is threatening about 2,000 homes. Cal Fire officials don't think firefighters will have the fire contained until the end of next month. Officials issued mandatory evacuations for all residences along Cachagua Road from the intersection of Cachagua Road at Nason Road, extending to the intersection of Cachagua Road at Tassajara Road. All residences on Tassajara Road at the intersection of E. Carmel Valley Road and Tassajara Road, extending approximately 17 miles to the end of Tassajara Road at the Tassajara Hot Springs Zen Center. This includes all roads that lead from the above described roads. This area includes Nason Rd. Other mandatory evacuations include the following areas: Robinson Canyon Road from San Clemente Trail to White Rock Gun Club, for Robinson Canyon to Rancho San Clemente Gate House including Arroyo Sequoia Road, for the community of Palo Colorado, for Bixby Creek Road from state Highway 1 south to Mesa Road, for the area between Cantera Run to Garzas Trail and for Old Coast Road and Rocky Creek Road. The Los Padres National Forest is closed and state parks from Point Lobos State Natural Reserve to Julia Pfeiffer Burns State Park including Andrew Molera State Park, Pfeiffer Big Sur State Park's campground and day use area and Point Sur Lighthouse are closed. Evacuations have been lifted for Riley Ranch Road, Red Wolf Drive, Corona Road and all of Carmel Highland. Pet owners who need help sheltering, rescuing or feeding their animals can call the Society for the Prevention of Cruelty to Animals for Monterey County at (831) 373-2631. People affected by the fire can get assistance by calling the Monterey County Department of Social Services at (800) 755-4400 of the American Red Cross of the Central Coast at (866) 272-2237.